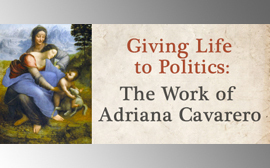 This three-day conference is a sustained engagement with, and celebration of, the life work of Italian feminist philosopher Adriana Cavarero. It also marks the publication of her most recent text “Inclinations. A Critique of Rectitude” (Stanford University Press, 2016). This entry was posted in 1-Events, 2-News, 7-Agorà and tagged arendt, Cavarero, University of Brighton by arendtcenter. Bookmark the permalink. On the 15th of April we will talk about “Eudaimonia” in Socrates, Plato and Arendt with prof. Gennaro Carillo. The Human Rights and an Economic History of Happiness at the Arendt Center on Tuesday 19 March 2019. On Thursday the 28th of February we’ll be discussing the power of “mimesis” in Philosophy, Literature and Cinema with Niedesh Lawtoo and Adriana Cavarero. The next lecture of the 2019 “Arendt Center” cycle of seminars on “Public Happiness” will explore the discourse on happiness in the philosophical works of the French Enlightenment. Next Thursday Maria Serena Sapegno will present her book on power and authority in the father-daughter relationship from ancient to modern literature. Copyright © 2019 Hannah Arendt Center for Political Studies All Rights Reserved.